Imagine running into the ultimate management mentor late one night on an otherwise deserted commuter train, and walking away from the strange encounter with an encapsulated guide to success in the corporate world. That's exactly what screenwriter and business coach Patrick Lencioni has done in The Five Temptations of a CEO: A Leadership Fable, placing his tale in an easy-reading and thought- provoking kind of self-help novel. Designed to be read in a single sitting, this book uses the unexpected meeting between troubled high-tech honcho Andrew O'Brien and a mysterious old man named Charlie to explore a series of common traps that can unwittingly ensnare any hard-driven executive. 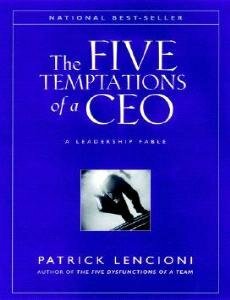 Lencioni hones in on the five "temptations" of the workplace: desires to jealously guard career status, consistently remain popular with subordinates, unfailingly make correct decisions, constantly strive for an atmosphere of total harmony, and always appear invulnerable. A discussion of the story's events and their real-world implications follows, as Lencioni shifts from screenwriter mode to business coach to help answer some of the questions he raises.